The government has agreed to allocate an additional RM700 million for rolling plans for Iskandar Malaysia over the next two years. Johor Menteri Besar Datuk Abdul Ghani Othman said the amount is an addition to the RM339 million set aside to the southern Johor growth region during the recent tabling of Budget 2011. 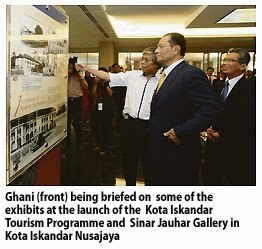 "Yesterday, Prime Minister Datuk Najib Razak agreed to add funds for rolling plans with another RM700 million for Iskandar Malaysia programmes," Ghani said in his speech at the launch of the Kota Iskandar Tourism Programme and Sinar Jauhar gallery in Nusajaya yesterday. He did not elaborate on the rolling plans. Sources said the funds may be for various infrastruture projects and new investments which have not been announced by the government. Najib is co-chairman of the Iskandar Regional Development Authority. On a related matter, Ghani said , Nusajaya is set attract more tourists with the new guided tours for the Sultan Ismail Building which houses the state assembly in Kota Iskandar. "In 2009, the building attracted 8,000 tourists, and between January 2010 and now, the tourist arrivals have risen by 30 per cent.